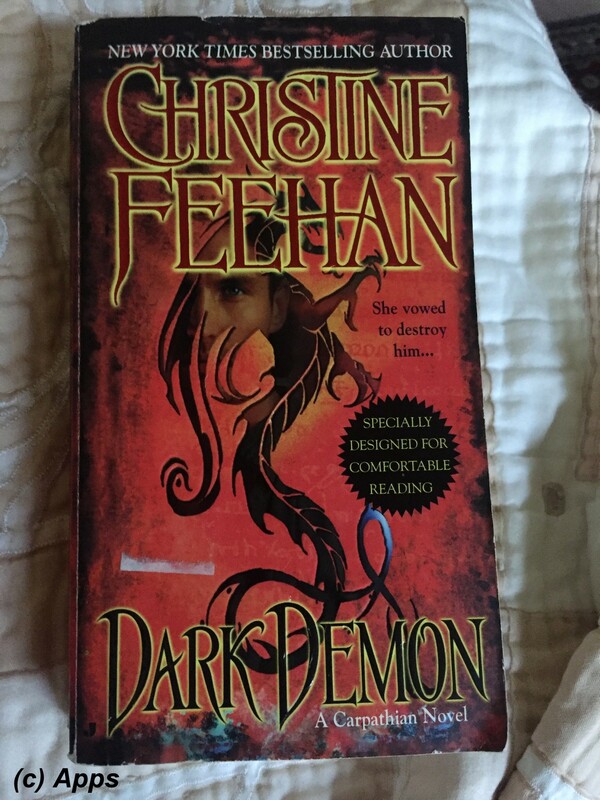 Dark Demon is the sixteenth book in the longest series, Dark Series, by Christine Feehan which was published in March of 2006. The primary plot is revolved around Vikirnoff Von Shrieder - an ancient Carpathian performing one last task before he would greet the dawn - and Natalya Shonski - the woman Vikirnoff was tasked to find and rescue while she is bent on killing the hunter. The plot is set in the small village at the base of the Carpathian Mountains where it all began for this series and follows the events of Dark Secret. Carpathians are a powerful and ancient race who are near-immortals living for thousands of years with powers and gifts that no man can fathom. Despite their gifts and extended lifespans, they are at the age of extinction as fewer and fewer children are being borne and far lesser of females. Without their female counterpart aka "lifemates" the male Carpathians lose the ability to feel emotions leaving the males with hard choice: either become vampire or "greet the dawn". Now that Prince Mikhail Dubrinsky finds a lifemate in a human female with psychic abilities and is capable of converting, there is hope for all the other Carpathian males who have been holding off from turning into vampires – the very creature that they hunt and kill to save the humans and Carpathians alike. The series now ventures into other species - Jaguar Species (with the 10th book Dark Symphony) and Dragonseekers (with this plot). In her 31st book, Dark Legacy released in September of 2017, Christine had introduced a new Carpathian female, Elisabeta Trigovise - an ancient and sister to Traian Trigovise and thought lost to them. Christine tends to bring back her characters and tie all the inconsequential details that she leaves around in her plots. The mention of Traian Trigovise made me want to re-read the series again since quite a few facts she had brought back in Dark Legacy were lost on me. In Dark Destiny, we see that Vikirnoff Von Shrieder is tasked to find a woman who has become target of the dreadful Society of Human Vampire Hunters. She has been escaping hunters, vampires and the humans alike. In Dark Secret, we come to know of her name as Natalya Shonski and Vikirnoff is still searching for her, missing her just by a few hours. Finally they both meet rather dramatically in an ensuing battle between Natalya and the vampires - Arturo and Henrik. Being from the Dragonseeker clan of Carpathians, Natalya had always been told to avoid hunters if not they would kill her. And now Vikirnoff has tied her to him. Confusion rails though her mind, body, heart and soul as to how she could betray her family while she is so much pulled to this hunter. Vikirnoff has his share of confusions too as to why she behaves so different from what a lifemate should be. Add to the mix are the vampires who are tracking Natalya, and who are not killing her, but they want her to find something. But Natalya is also having a compulsion to go to the Carpathian mountains and find something. How they both will fight these enemies and what happens next is a twist of turns that is unimaginable to a reader's mind following this series. As much as Natalya is an anchor to Vikirnoff, he also forms an anchor for her whenever her dargonseeker abilities seem to go out of hands. I see an equal distribution of power, strength and respect between these two characters. Not that it wasn’t there in other pairs, but this is the first pair I felt that Christine made them really equal in every level from the beginning of the plot. Finally we get to see the Carpathian healing chant and the Carpathian words of ritual to bind lifemates in Carpathian language. It’s a proto-language of Hungarian and Finnish languages as mentioned by Christine in her opening notes. Christine further expands on the Dragonseeker clan of Carpathians along with Wizards whom we had read about in Dark Symphony and Dark Secret. The plot becomes bigger and better here what with fight scenes involving shadow warriors, a master vampire at play along with a powerful mage. However, Christine doesn't forget the tidbits that she left for us as breadcrumbs in past plots - Natalya resides in the same inn and the same room as Raven Dubrinsky was in the Dark Prince plot, we see that Natalya finds the deep grooves that Mikhail makes them in the form of a large owl in that plot; lots of references to Traian Trigovise & Joie Sanders time in the cave that Natalya is pulled to; reasons why Traian leaves the Carpathian mountains along with Joie; shadow warriors reappear. Natalya's brother Razvan Dragonseeker appears more stronger with a full-on background to his character in this plot. Surprisingly although Razvan is portrayed as an antagonist, he captured my mind more than the actual protagonists of the plot. It makes me hard to believe that such a strong character as Razvan would be an antagonist. And I know for sure there is a plot for him coming up soon. Mikhail and Falcon are shown as injured in a battle. But Christine did not have a plot around that fight in any of the books that led to this plot. However, it does show that the Carpathians continue to fight even though Christine doesn’t pen them out. Funnily enough Christine has Natalya referencing to all the late-night horror film creatures - Freddy Krueger specially - and superheroes such as Superman or old classic movies like King Kong, making her more human than Carpathian. On the flip-side Christine gives us the darker side of science and magic, how bio-warfares are made and how they impact every living being on earth. Christine throws everything at the Carpathians in this rather elaborate plot, with more antagonists, more twists, complicated battle sequences, heavy emotions involved, and sort of kind-a becomes another reunion kind a plot since most of the Carpathians come together. A few tidbits: This book misses the hard card inserts that gives reader an opportunity to either join a book club and win books, or buy a book and get a few free. There is an advertisement for dorchester publishing at the end of the book enticing readers to join their club and buy books. Although we know now that in 2012 this publishing was acquired by Amazon Publishing and it shut down as dorcehsterpub. Another powerful paranormal plot woven by Christine Feehan keeping us thoroughly entertained and immersed into the world of Carpathians. As always the fight scenes are excellent and love scenes are very romantic bordering on eroticism. Christine has certainly left the readers with so many minute details that they would be craving to read those details becoming important in future plots. Watch this space for more reviews of the next books in the series. a. Natalya and Razvan's parents are Soren - a half Carpathian and half mage - and Samantha, a human. b. Natalya and Vikirnoff find two dragons encased in ice - red and blue colored. The same dragons that Traian Trigovise and his lifemate Joie Sanders find, except that they assumed it was one, but instead there are two of them in that ice case. c. Natalya's father puts a compulsion in her mind to find the ceremonial knife and the ancient spell book - both possessions of the dark mage Xavier. The same book that Sara Marten was being forced by the vampire to hunt in Dark Descent. d. Christine creates appendix sections starting from this book that come in two parts - Appendix I listing out Carpathian Healing Chants; Appendix II listing out Carpathian Language. e. Razvan was shown to take blood from a small child with bright copper curls. Wonder who that girl would be. a. Would love to ask Christine Feehan as to why she didn’t have Barack claim Syndil early on, why make him wait till after Darius makes his clam on Tempest in the sixth book Dark Fire? Also why not a separate book or a novella for Barack and Syndil instead of spreading their story within two books - fifth book Dark Challenge and sixth book Dark Fire? b. In Dark Descent, we see quite a few sub-plots: Small details floating around, but I am sure Christine will be collecting them in a bigger plot later. i. Gabrielle Sanders and Jubal Sanders are introduced - siblings to Joie Sanders. As of Dark Demon plot they reside in Carpathian Mountains taking care of the kids during the day, whom Sarah Marten and Falcon have adopted. The owners of the inn in the village, Slavica Ostojic, her husband Mirko Ostojic and their daughter Angelina, help them too. Gabrielle is turned to Carpathian in this plot and tied to Vikirnoff for all time. ii. While being tortured, one of the master vampire takes Traian's blood giving the vampire ability to control Traian - although Traian beats him at that control. However, not knowing who that vampire was and where he was, Traian decides to be away from his people. However, I don’t remember this tidbit being explored by Christine in any of the future books. Perhaps that is why she brought Elisabeta Trigovise in the 31st book, Dark Legacy's plot. Or I might have to read the additional 100 pages that Christine included in a later version to know the truth. c. In Dark Melody, Julian and Savannah both muse that Gregori and Savannah should be blessed with twin girls who would run amok much to Gregori's suffering. d. Colby Jansen has the same last name as Gary Jansen. Are they related? a. Gary Jansen first time introduced in Dark Magic, doesn’t have a story of him yet - 18 years since his character had first been mentioned. Recently Christine announced in her blog on Goodreads that Gary's story has to wait as his lifemate is a child now. I wonder who that child was and if she had already introduced that child in any of the recent books. And if she is basing her on one of her granddaughters' - just like Skyler - and she would wait till the grand daughter would grow in real life before penning a story between her and Gary. b. In Dark Dream, Sara Marten adopts seven sewer children - three girls and four boys - all with psychic abilities. c. Skyler Rose Thompson is first introduced in Dark Legend, as a 14 year old girl who is battered and injured in every way. Above all she is a psychic. We are going to see more of her, but Christine has left enough clues to readers to guess who her lifemate would be. d. In Dark Legend, Francesca muses if her child would be one of those rare females since she had perfected the art of living like a human and walking in the sun. Wonder what would the fate of this child would be in Christine's hands. e. Barry Woods, a reporter in the Dark Legend plot is not meted with justice or purged of the vampire's influence or any more exploration of his mind to understand about the Society of Vampire Hunters by Christine. Perhaps a future character? f. Corrine Wentworth (lifemate to Dayan) gives birth to a female psychic child - Jennifer - in Dark Melody. g. MaryAnn Delany is introduced in Dark Destiny, a female with strong psychic powers and also one who works with the battered women and children. She perhaps will be a lifemate to another Carpathian soon. h. Jasmine Sangria - sister to Juliette - and Solange Sangria - their cousin - are introduced in Dark Hunger plot. Strong psychics from the Jaguar species who could potentially be lifemates to Carpathians just like how Juliette is for Riordan. i. Colby Jansen - lifemate to Rafael De La Cruz - has two step-siblings - Paul and Ginny Chevez. And Paul is tied to Nicholas De La Cruz by blood bond. a. Few children who have born are Males, most not surviving the first year of their life, females are rarely born. Shea Dubrinsky along with Gregori Daratrazanoff are trying hard to find a way so children survive. b. With Dark Symphony, Christine introduces a new concept while converting a psychic female with Jaguar blood - Antoninetta Scarletti's blind eyes seem to be giving sight back to her. c. Vampires are congregating; attacking in coordinated methods; doing a hypnotic dance to transfix the Carpathian hunters; ability to create a holding spell; able to inject a fast acting poison impacting the nervous system; can cause Carpathians to sever the mental path the Carpathians share; casting a silvery net to capture the hunter in their molecular form; two master vampires running the show together; use animals such as rats, birds and insects to pry on others; a multigenerational poison that could attack the healers. d. Society of Human Vampire Hunters who constantly hunt the Carpathians mistaking them to be Vampires. The Morrison Center for Psychic Research is targeting psychic humans, documenting about them to kill them in the end. e. The antagonist Vampire was after Sara Marten in Dark Dream, as he needed her help to track the tomb of the master wizard and book of knowledge that will give access to untold power. f. Malinov Brothers are introduced in this Dark Secret plot; they were sent to Asia by Vladimir Dubrinsky to fight vampires, instead they become the very thing that they were sent to kill - Kirja Manilov killed by Rafael De La Cruz with aid from Vikirnoff Von Shrieder in Dark Secret; Maxim Malinov killed by Mikhail Dubrinsky in this plot; Ruslan Manilov is the eldest of them. 5. Lifemate pairs introduced as the series progresses: Will Christine have a plot for these pairs sometime in future? a. Eric and Celeste – Celeste is pregnant with child in Dark Prince, but no mention of them in the books after..
b. Vlad and Eleanor Belandrake - In Dark Symphony we see that she has given birth to Benjamin "Benj" and also adopts Josef - son of another Carpathian pair who are lying in ground now, Lucia and Rodaniver. c. Tienn and Diedre - Diedre is sister of Vlad. d. Vladimer Dubrinsky and Sarantha - Mikhail and Jacques Dubrinsky's parents - They are shown as dead as of Dark Guardian plot. a. Dimitri Tirunul – another ancient Carpathian mentioned briefly for the first time in Dark Desire plot. First introduced almost 15 years ago, we as readers already know that his story would not be until the 25th book in the series. He is a renowned scientist; works for preservation of wolves and guards them in the reservations of Russia; and has a wolf foundation. b. Dominic Dragonseeker - Introduced in Dark Symphony, with added little details about wizards / mages and a war between them and the Carpathians. He is looking for his sister - Rhiannon Dragonseeker - a powerful mage although just an apprentice, thought to be lost. c. Josef and Benjamin "Ben" - Carpathian male kids, first introduced in Dark Symphony. d. Remaining De La Cruz Brothers - Manolito, Nicolas and Zacarias - living in South America are introduced in Dark Hunger plot along with Riordan. Manolito is in Carpathian Mountains with their Prince as of Dark Demon plot. Rafael and Riordan find lifemates in Dark Secret and Dark Hunger respectively. e. Razvan Dragonseeker - Natalya's sister and thought to be dead. He meets her in her dreams however. Although he has children with three different women - one in CA, TX and third one in France. He is father to Colby Jansen who lived in CA before she became lifemate to Rafael De La Cruz and moved to South America. a. Shea O’Halloran – lifemate to Jacques Dubrinsky, first female born after more than 500 years and a natural healer. Her story is in Dark Desire and is pregnant as of Dark Melody plot. e. Francesca Del Ponce - lifemate to Gabriel Daratrazanoff. Her story is told in Dark Legend. She is a powerful healer; has ability to bring peace to anyone who is in her vicinity or by touch; makes stained glass patterns and quilts that are specific to one's need and bring healing to them..
f. Tamara - daughter of Gabriel Daratrazanoff and Francesca Del Pounce, born a few months before the Dark Guardian plot. g. Rhiannon - a Dragonseeker who was kidnapped by the powerful mage, Xavier, eventually giving birth to triplets - two daughters and a son - with Xavier who had killed her lifemate. Natalya is the descendent of that son. And that Rhiannon caused the war between Carpathians and the Dragonseekers. a. 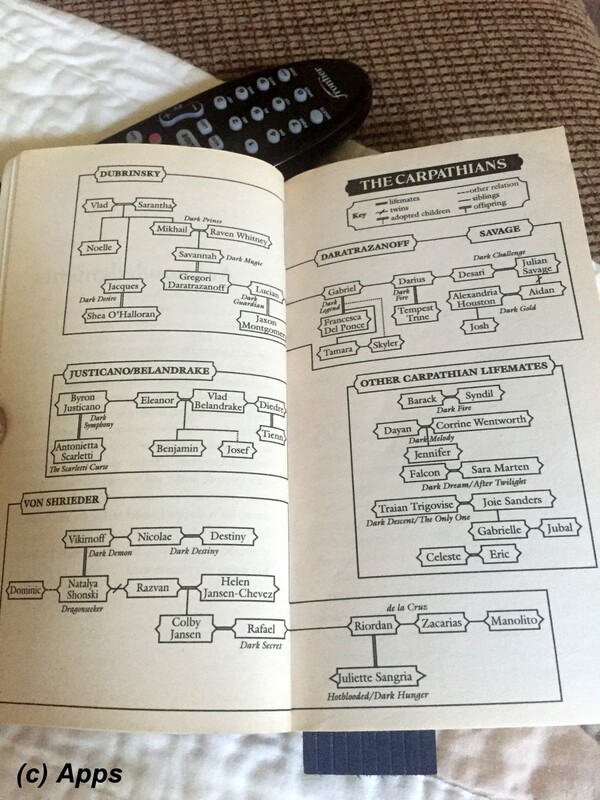 In the beginning of the book, where Christine has her family tree, she misses mentioning Nicolas De La Cruz in the family tree and she also doesn’t have Dragonseeker families listed considering this book was all about them. b. On Pg. 139, line 18, it should be "..have for a while…"
c. On Pg. 144, line 2, it should be "..want me to carry…"
d. On Pg. 308, line 5 from bottom, it should be "…all of the hunters wounded…"